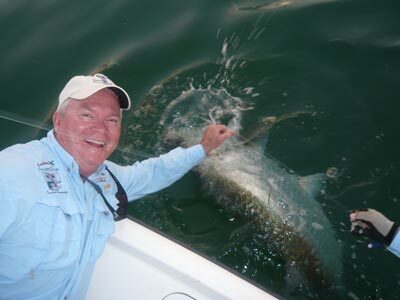 Astronaut Bruce Melnick caught and released a 170 lb. tarpon in the La Siesta Sunrise/Sunset Tarpon Tournament, a Redbone@Large series event April 15 - 17 for cystic fibrosis research. "It was an awesome weekend," said astronaut Bruce Melnick sporting a huge smile. The two-time space shuttle astronaut, one of the celebrities among the 20 anglers, had just hours before caught and released a 170 lb. tarpon in the La Siesta Sunrise/Sunset Tarpon Tournament, a Redbone@Large series event April 15 - 17 for the cystic fibrosis research. Melnick not only caught his largest tarpon ever -- some 50 smaller ones preceded it over his years of fishing -- he exclaimed, "The last morning, while motoring out at day break in Capt Matt Bellinger's skiff, we were treated to a great surprise of watching the space station fly overhead for several minutes, followed by my 170 plus pound tarpon, and then a breath-taking sunrise. "It doesn't get much better than that," he beamed enthusiastically. Gary Hall, of Niagara Falls, N.Y. would second that. Guided by Capt. Jim Dalrymple, he was the grand champion angler in his first-ever tarpon tournament, catching and releasing three silver kings. "They were everywhere," said Hall. "I caught two in the evening period and my last one on Sunday morning before having to leave early for a Miami meeting. It wasn't until later that I found out I had won." The two grand champion anglers and their two captains were each awarded paintings from the Redbone Gallery from the works of artist Pasta Pantaleo. The La Siesta Resort and Marina in the heart of Islamorada at MM 80.5 with its cottages, villas and suites served as the headquarters and hosting sponsor for the second year. Anglers fished beginning at dawn from 6-10:30 a.m., on Saturday and Sunday with a middle Saturday session at dusk, from 4-8 p.m., featuring what Melnick called a beautiful sunset and a near moon rise. The tournament closed with a Sunday noon awards luncheon. In the team division, Dr. Robert Cullen, a long time supporter of the Redbone tournaments along with one of his sons, Michael, won by catching two tarpon each, while fishing with Capt. Kenny Knudsen. Cullen, the Head of Pediatric Neurology at Miami Children's Hospital, made a family affair out of the event as three out of his four sons fished the tournament. Hall and Dale Lusk were the runner-up team. Dr. Cullen also won runner-up angler based on time. Under the near full moon, celebrity musician Clarence Clemons, the "emperor" of the E-Street Band, wailed the night away on his saxophone with the local Marlin Too Revue after the event's kickoff dinner and silent auction. For tournament information on this and nearly 30 other tournaments across the country and the Bahamas go to the Redbone website at www.redbone.org, or phone Redbone executive director Susan Ellis at 305-664-2002 or via susan@redbone.org.